At Vauxhall, there is evidence of bridges crossing the Thames for the last 3500 years. 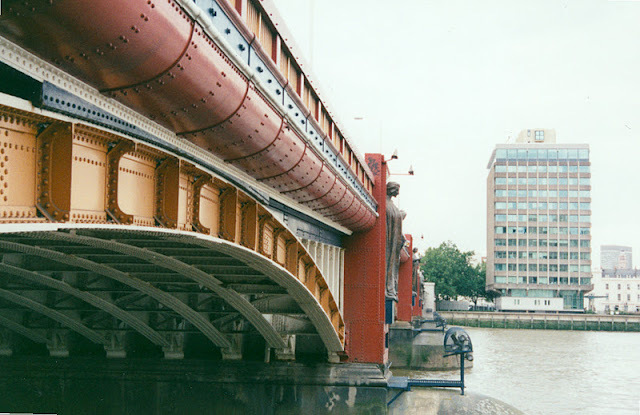 The current Vauxhall bridge replaced an 1816 iron bridge that was too narrow and eventually had too many structural problems to warrant repair. The new bridge (designed by Alexander Binnie and completed in 1906) is five steel deck arches supported on granite piers and abutments. This bridge has distinctively painted arches and balustrades (mustard and ketchup colored) and giant bronze statues of women standing on the piers representing human achievements (farming, architecture, etc). The bridge is 246 m (809 ft) long and 24 m (80 ft) wide. It was declared a protected structure in 2008. The Tyburn and Effra Rivers used to empty into the Thames at Vauxhall Bridge, but there is little evidence of them today (they flow underground in pipes). There was a penitentiary on the north bank that was demolished in 1867. The Vauxhall Gardens entertained visitors from the the 16th to the 19th centuries. Today, the headquarters for M16 sits on the south bank and the Tate Britain Museum and the Chelsea College of Arts sit on the north bank. Thames River Bridges: Vauxhall Bridge by Mark Yashinsky is licensed under a Creative Commons Attribution-NonCommercial-ShareAlike 3.0 United States License.